Here we go again! Please navigate the clips below from prior performances to stay on your game. There are rehearsal links on the "Student Choir Web Page"
We were once again invited to sing the National Anthem at an Anaheim Ducks game Friday, March 20th 2015!!! Our second round at this went very well! We're hoping to secure an "Angels Game" someday. Listen to the studio recording of my arrangement of the Anthem by Clicking Here! The new School Choir CD sales have leveled off at about the 200 mark. We have plenty more for sale! Pick yours up at the school office for just $10.00! 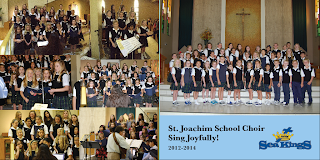 Click here for the latest from the St. Joachim School Choir. 5 songs from the "Water" collection have been accepted for publication by "World Library Publications" Look for "Call On The Lord" in March '17, followed by "Heaven and Earth Are Wed", "Water", "The Sound of One Voice" and "Do Not Let Your Hearts Be Troubled". 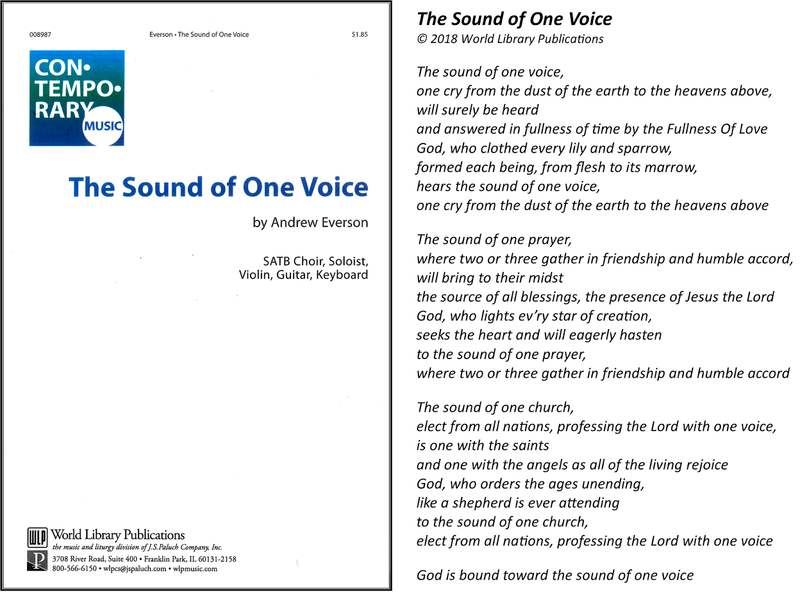 The Christmas carol "Give Jesus a Dwelling Place" and the Easter hit "He is Risen" are also available in Octavo form from Oregon Catholic Press. Just click on the titles to place an order. OCP also carries my "Canticle of Zechariah" from the "Psalms & Canticles" CD. To obtain Manuscript for other songs you've heard on the"Water" collection, the "I'll Follow" collection or the "Psalms & Canticles" collection please contact me via email at andrew@andreweverson.com with the name of the song and how many copies you'll be using and I will send you a PDF copy over the web or via snail-mail for you to duplicate. I am currently charging $1.00 per copy and I am trusting that the "Honor System" will suffice as a contract. Oregon Catholic Press has now published four of my works. (Good and Faithful Servant, Give Jesus a Dwelling Place, He is Risen and Canticle of Zacahariah) I regularly submit songs for publication. For all the latest recording and publishing info read here. Every song has a story to tell. You can dig in more right here if you are a true junkie for poetry, lyric and song background. Click here for info on all of Andrew's cherished musical instruments. As many of you have already heard via Facebook etc. the Little green truck has finally been retired. Read more about it! My 5th from World Library Publications! This piece brings the sounds of a Southern Spiritual to our Funeral and Memorial masses here at St. Joachim. These past five songs are all a part of the "Water" CD, so get a copy from the 'Albums' sections of this website! 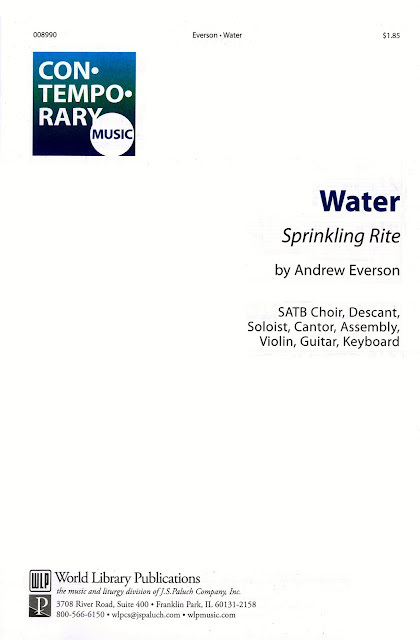 Click HERE to listen to our choir's recording from the "Water" CD. More to come! This is my 4th with World Library Publications and 8th in overall publishing. 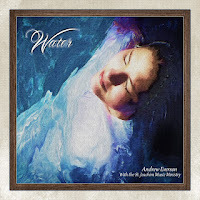 This is also the 4th published song from the "Water" CD, which can be purchased either at St. Joachim or from this website. A quick sound bite can be heard in the album montage HERE at the 4:44 mark. More in the Fall! I have recently been diagnosed with Meniere's Disease which is a disfunction of the middle ear on my left side. The effect thus far has been an appreciable loss of responsiveness in the mid to low range frequencies. I've been through many treatments thus far including inter-ear cortosone injections and a complete MRI to rule out the presence of a tumor. I continue treatment now with a low salt/low sugar diet, a regiment of dietary supplements and a series of experimental drugs, each of which I will try out, one at a time. "Water" has become the standard setting for the sprinkling rite for masses here at St. Joachim over the past few years. Now it is published by World Library Publications for parishes everywhere! This is the 3rd of 5 songs currently in the pipeline. 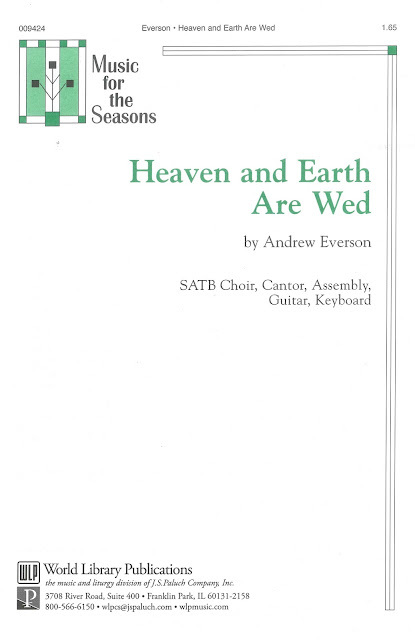 Heaven and Earth Are Wed! By now this is a standard Christmas carol here at St. Joachim's Church but it is now freshly published for the rest of the world by World Library Publications. 'Here's to selling a boat-load! 'Call On the Lord' Has Arrived! ... and so have I as a composer for World Library Publications! Here is to hoping for truckloads of sales for this piece and many others! Upon re-reading this article which seems to resurface every 4th of July I feel moved to post it here. 'America the Beautiful' is among the greatest marriages of text and music ever written in the English language. This article tells the unlikely story of how the text met the music. Divine providence? I thinks so! Click here. 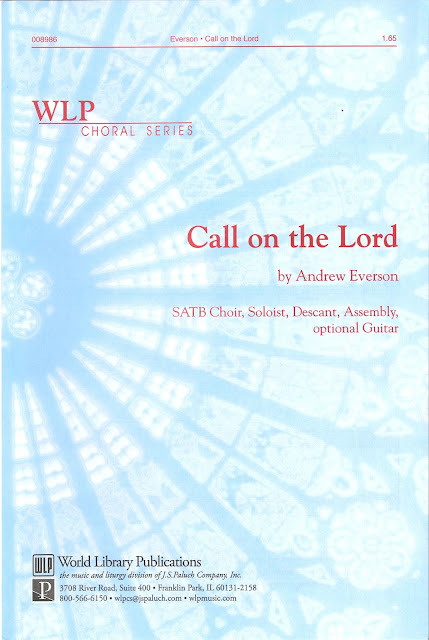 I am now finishing up final editing on five manuscripts which will go 1st to WLP, who has published "Call On The Lord" recently with 4 more to come (see below). I am so glad to have a new home for my music! The new package going out will include "The Sun Never Sets On Your Kingdom", "Dwell Within Me", "From the Wood of a Manger", "I'll Follow", and "Is There Anything Love Can't Carry". 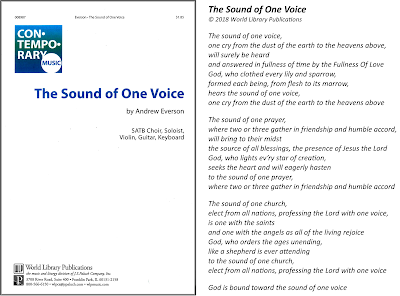 These have all become standards here at St. Joachim, but some of them have also found their way into other local churches/choirs as well, among them St. Paul the Apostle with Christopher Walker who sees my work regularly at the Southern California Liturgical Composer's Forum. 5 More Songs To Be Published!!! 'Great to know that our music will have the chance of reaching the greater church in the coming years! Psalms, Psalms, and more Psalms!!! In addition to celebrating the new CD with a concert we also celebrated my 25th anniversary as Music Director here at St. Joachim Church! I was modestly lampooned with old photos and stories from my baby sister Kathleen that Frank Consoli dug up. Yes, it was about this time 25 years ago that I packed up my green truck with all things musical and a few things to wear, left Colorado behind and headed for CA. I was after a crazy "banjo" dream, (more here) but God had other plans. After sending out many resumes I was hired part time at St. Joachim's and my only responsibility was to cover music for the Sunday evening mass. That went pretty well and the job description slowly hemorrhaged into its current form. My professional level banjo playing is a thing of the past due to an overuse injury, but my former band-mate, Barry Thorpe, passed along some rare footage of my banjo antics from early 1990. Click here and you'll see/hear an aspiring Bela Fleck junkie with the band "Shrink-to-Fit". "Good and Faithful Servant" has been published and is now available from Oregon Catholic Press! Click on title to hear new mix! This is our 4th song published by OCP, and the 3rd song from the "I'll Follow" collection to make the publishing cut. "Good and Faithful Servant" has been distributed in OCPs' choral packet #75 making it known and available to choirs everywhere in the English speaking world. Hopefully we will continue to receive good news like this on others works that serve our parish well. To all who attended our "Adopt-A-Song" concert, thanks for a great evening!!! You really helped make the "Water" CD possible! Hopefully we'll do this again for another CD! "Poetry, Lyrics and Song Background" will give you just what it says on most of my music. "Andrew's Arsenal" will give any musical instrument junkies more info than most would want to know about the instrumental contents of my garage! "I'll Follow" CD sales have surpassed 600 mark! That just might be a "teflon" record according to Billboard standards! I believe that sales will more or less stay around there unless and until I can get something more substantial happening in the publishing world. On Mondays and Wednesdays I provide private instruction on most stringed instruments at Mo's Fullerton Music in downtown Fullerton CA. Most of my students are learning Violin/Fiddle, Cello and Viola, and others are learning Mandolin or 5 string Banjo. I can also get people started on some quirky world instruments like the Andean Charango, or the Chinese Er-Hu. Mo's is one of the last great "Non Super-Chain" music stores around and has a full selection of instruments, sheet-music and gifts. (Not to mention lessons with FANTASTIC teachers!) It's a great stop if you are ever in downtown Fullerton. If you'd like to inquire about lessons with me or any other teacher, contact the store at 714-871-1805 or click the name of the store above to drop an email. Violin (Fiddle), Viola and Cello Links! Click here for helpful youtube links and other info to help you along at home. RIP Little Green Pick-up Truck! The wondrous truck lost its gear-box and rolled to its final stop on the evening of St. Andrew's day, November 30th 2014! Finding parts has become increasingly difficult and we will now retire this beloved vehicle. In 1989 while still living in Colorado Springs, CO, I bought a 1982 Volkswagon Rabbit Diesel Pick-up Truck with an odometer reading of 112,000 miles from a meat inspector for the FDA. (During the test drive, he went on and on about how many “bug parts” per million were allowed in the ground beef.) I purchased the truck for $1200 hoping that it would be large enough to carry me and all my music gear to CA, where I planned on becoming the 1st international rock star on the 5 string banjo. On the way out I stopped briefly (5 minutes) to see Las Vegas and wonder “why?”, had my first encounter with a desert, and I recall my first terrifying trip down El Cahon pass into Southern Cal as Bela Fleck played “Tell it to the Governer” on my cassette tape player. It was a perfect match. In my first few months in Orange County, I began work at two churches (St. Joachim and Blessed Sacrament), was playing fiddle in a Western Swing band called the Electric Tumbleweeds, and was beginning to find musicians to perform my odd banjo music. (I'm fairly certain that I was the only one working this sort of combination.) I also kept in touch with my “fiance to be,” Diane, and went out to see her in Colorado occasionally. 12 hours into a trip home from seeing Diane in Colorado I lost power going up a hill in the Mojave Desert and pulled over. Only then did I notice that I had totally overheated the motor. I was towed into the lovely town of Barstow, CA, where I had to make a quick decision. Do I leave the truck there with all of the other vehicular carcasses or do I get it fixed? I took a bus home where two choir members (Ruth and Lupe) helped me to get back on my feet, and I came back to get the truck in my band-mate’s pick-up truck with my good friend and producer Rich. A few thousand dollars and two mechanics later, the truck was rolling again with a new motor, and I wondered at 125K if I had made a good decision. 23 years later, (2014) she had over 420.000 miles. My wife and I were fast asleep at 3:00 one morning when we were suddenly awakened by the unmistakable sound of that diesel motor firing up outside. I ran out of the house in my skivies hollering and screaming as the thief was pulling away as quickly as he could in such a vehicle. At a very casual pace, the police arrived at the scene of the crime, and I quickly realized that this was really no big deal (to them). After surviving several days without the truck, and missing it dearly, we finally got a call from the police in Ceritos informing me that I could (for a price) come and retrieve my truck. While I was glad to hear the good news I couldn't help but wonder if the car thieves and the impound lots weren’t co-conspirators in the crime. Did You Paint Your Truck White? Just before Easter 2010 I bumped into an old friend at church who owns a truck just like mine, with 2 exceptions: It it is white and the mileage was only 68K! He had offered to sell me this truck several times in the past but I had always told him "no thanks, my trusty green truck runs just fine". This time was different. He told me that he had just listed the truck in the paper and the add was due out on the following Tuesday. This was my last chance to purchase a very low mileage copy of my own trusty vehicle, which was still running beautifully. What to do? I called Marc, my trusty mechanic, to get some solid advice and he put it to me like this: "Buy the truck, you idiot! When the green truck finally dies, park it in your garage and use it for parts. You'll probably get 400-500K out of the white truck as well! This is the cheapest transportation money can buy!" So, no, I did not have the green truck painted! I own two identical trucks and I await the demise of the high mileage green one while I drive them both about equally. (Watch and wait, as the high mileage green outlasts the low mileage white!) The green one still runs fantastically well and I anticipate that it just might make the half million mark. Who knows how far it will go? It's always been on a "Mission from God"! As I was returning from a full slate of Sunday masses, traveling northbound on the 57 freeway the truck suddenly slipped out of gear. I tried reengaging a few times as I moved to the right, and with no luck getting it into gear I rolled to a stop just short of the Lincoln Ave.exit. I had just been thinking along the way about how many more years it would have to last to make it to 500K. 2 to 3 years would've done it. I then had it towed to my mechanic, Marc, who looked it over and then called me down to his shop. I was hoping to hear him say that a simple adjustment to the clutch cable did the trick and I could get right back on the road! However he met me in the parking lot and with his hat over his heart he said "Andrew, I think it's time." He COULD fix it, but acquiring parts would be very costly this time around. And it happened on St. Andrew's day! Perhaps Andrew was watching over it, seeing to it that I got through all the masses of his feast day before allowing the final blow which would take out this marvel of transportation. Mission from God? You bet! I hope that this mission continues as the green truck provides vital internal organs to the white truck on its journey forward. WLP: A New Home For My Music! I have been contacting those choirs nationwide which I think would be inclined to perform my music, based on their repertoire and style. Many of them have a submissions process of their own and I am sending each choir the music which I believe suits their style. 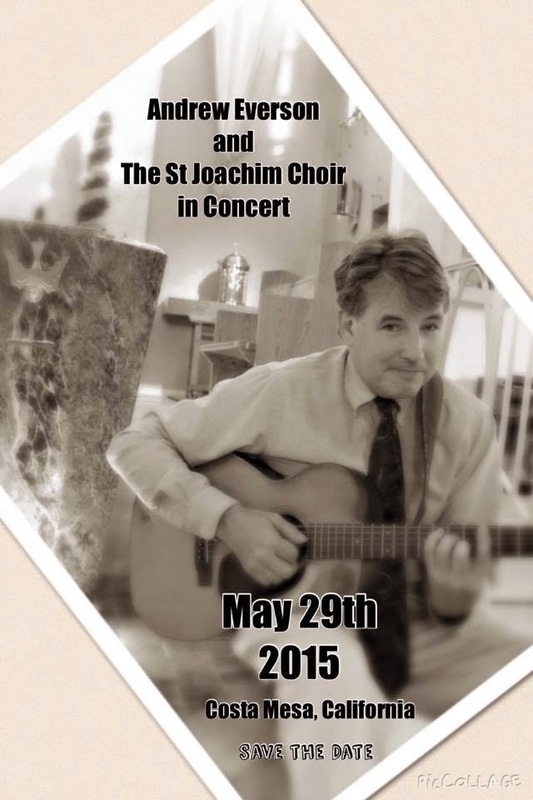 I also continue writing and springing new songs on St. Joachim choir and church, as well as the school choir. The home-page has great recordings of the school choir singing arrangements of mine like "The Star Spangled Banner"and "Bridge Over Troubled Water" in addition to the School Choir CD which includes my arrangements of covers such as "Lean On Me"and "He Ain't Heavy". I direct 3 choirs for St. Joachim Parish and all of them are active in serving the community on Sundays throughout the year. (With a little break in the Summer). The morning choir sings each week at the 10:00 mass. Accompanied by Piano, Guitar and Organ with ocasional violin, a small but mighty chorus knocks out everything from Chant to traditional hymns to contemporary songs to the colorful pieces by yours truly! 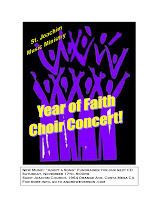 I began the music ministry at St. Joachim in the fall of 1990 when I took on the task of creating an ensemble for the Sunday evening youth mass. I knew that I had the skills to do this and I needed some part-time work. I realized right away that I would have to take this work VERY seriously when I met my new boss/pastor Fr. Ken Krause. Every meeting or conversation with him was a tremendous learning experience as he helped to deepen my understanding of Liturgy and how music can best enhance the mass. Personalities like Bob Felde (Bass/Vocal) Greg Smith (Gtr) and Pamela Valaika (Vocal) helped get things going and we were soon able to create a decent sound. This was no small task for a parish that has a rather small English speaking community. I also insisted that the groups sing together for large events like Christmas and Holy Week. Most parishes I knew of at the time had no contact whatsoever between the traditional morning choir and the ensembles which served at other masses. I’ve always felt that this was a waste of good talent. While some have more traditional skills like sight-reading and classically trained voices, others have better improvisational skills, and some people have both. Some folks have a little natural talent, and just need to be “in the game” a while before they catch on and become great contributors. All types have conspired to make this ministry unique and powerful. From early September through late June both masses have excellent music and a deep bench of talented singers and instrumentalists. Come celebrate with us at 10:00am (Family mass with traditional/contemporary music) or 5:00pm masses (Youth centered contemporary selections, chosen and performed in a VERY Catholic way). 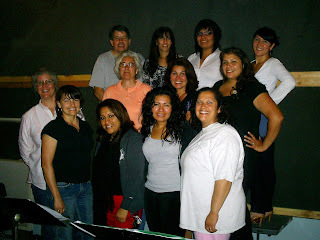 Each Thanksgiving, Holy Thursday and Easter Vigil, the English music ministry combines its talents with the Hispanic choir, which I've been leading since 2014. (That's another story!) We have some of the best Bi-lingual masses anywhere here at St. Joachim! During July and August masses are typically covered by our summer duets. It’s just myself and one other choir member as we drop it into low gear for about 8 weeks. It’s a different, but very good sound, and it allows me to get to know some of my hard working choir members a little better. The down time also affords me the time to prepare for the next choir season. Along the way, many members have come into the ministry and stuck with it. (Why? I'm not sure!) Long standing current members (In chronological order as best as I can remember) are my wife Diane, Frank Calabretta, Jill and Kevin Cavanaugh, Tim Murphy, Bob Lee, Cynthia Morehouse, Joe McCarthy, Katy Loving, Cheryl Hebestreit, Bernadette Kanaly, Mark Rathsack, Alex Frausto, Mireya Velez, Aileen Penn Briceno, Liza Marmaud, Gene Gleason, and Hilda Fores. The youth mass group has grown considerably lately as teens continue to swell our ranks. Fr. Ed Becker, sang tenor and was cantor at many a mass in the mid-late 1990s as he was discerning his vocation. Being called from his career as a lawyer, Ed answered and entered St. John’s Seminary in 2000 and became a diocesan priest in the Spring of 2005. He served as parochial Vicar at St. Pius V church in Buena Park from 2005-2009 and has recently completed Eclesiastical studies in Rome. He served as Pastor of St. Joseph's parish in Santa Ana for a while and is now pastor at Our Lady of Guadalupe in La Habra. Martin McSweeney played Bass and Guitar with us in the late ‘90s and went on to receive his bachelors in music at Berkely School of Music in Boston. He returned to Southern Cal and is now serving at St. Agathas Catholic Church in Los Angeles. (Last I checked, he was still single!) St. Agathas is THE Catholic church to attend if you appreciate good Gospel music! This choir got started in 1998 as I attempted to pull together school talent for school events such as Catholic Schools Week and Graduation Mass. It was pretty hapless and disorganized until I had the good fortune of meeting Jill Cavanaugh, who offered immense help in organization and in co-directing the students. She is very detail oriented, which is absolutely necessary when working with me as a partner! Her vocal skills help to facilitate the choirs ability to sing in 2 and 3 part harmony and her experience as a classroom teacher helped immensely in understanding the needs of kids this age and in communicating with parents. This partnership has been quite fruitful for the parish as the student choir typically sings at Sunday mass closest to "All Saints Day", Christmas eve 5:00 mass, Catholic Schools Week mass on the last Sunday of each January, mass on the 2nd Sunday of Lent, Good Shepherd Sunday during Easter season, the School 1st Communion mass and the School Graduation mass each year. The Student choir also performs at the annual Diocesan Choir Festival each May. Many members also go on to sing in the Youth Choir at 5:00 on Sundays. Some of our best stuff ever! 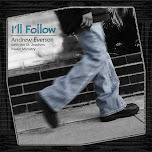 Don't miss our latest offering with 13 superbly written, performed, and recorded songs from Andrew Everson. Sales are off to a brisk start, especially considering how difficult it is these days to market a "CD" in a flurry of on-line alternatives. Five of these songs are now published by World Library Publications! ("Call On The Lord", "Heaven and Earth Are Wed", "Water", "The Sound of One Voice" and "Do Not Let Your Hearts Be Troubled". We still believe in the "Album Package" with art-work, credits and all the trappings that should surround a great collection of recordings. A 7 minute montage of clips from the album can be heard by clicking HERE. "I'll Follow" CD sales have surpassed 600 mark! That might just be a "teflon" record according to Billboard standards. 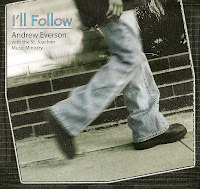 Here was a great review of the "I'll Follow" CD up at a Catholic music website. It's rather short, but flattering none the less, and can be accessed here at Catholic,com . This article allows you to comment on the review, so go on and say something nice! 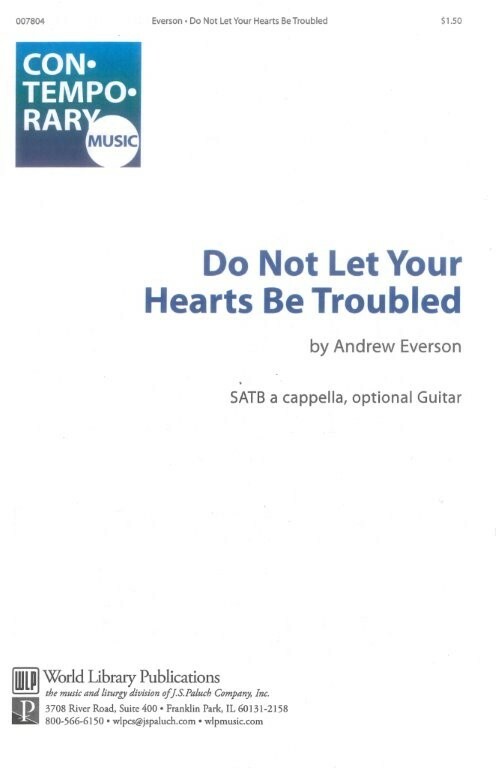 Recorded between 2007-2009, this collection features 11 original songs by Andrew Everson, 4 of which have been published by OCP and are available now for choirs everywhere. The manuscripts for “Give Jesus a Dwelling Place” “He is Risen”and “Good and Faithful Servant” have been selling briskly and several other hot cuts like “Jesus!”, “From the Wood of a Manger” and have been submitted for publication. Another song included is “When Angels Sound the Trumpets Call," a collaboration combining the music of Andrew Everson with a vibrant apocalyptic text by Steven Ottomani. Steven was the winner of the 2008 National Pastoral Musicians Hymn writing contest, who also has songs published by OCP, Pepper music and others. This album, like the one before it was recorded by Jim Monroe, and Rich Mouser, who also mixed and mastered the CD with Andrew Everson. Soloists include Bernadette Kanaly, Cynthia Morehouse, Liza Marmaud, Aileen Penn Briceno, and Andrew. 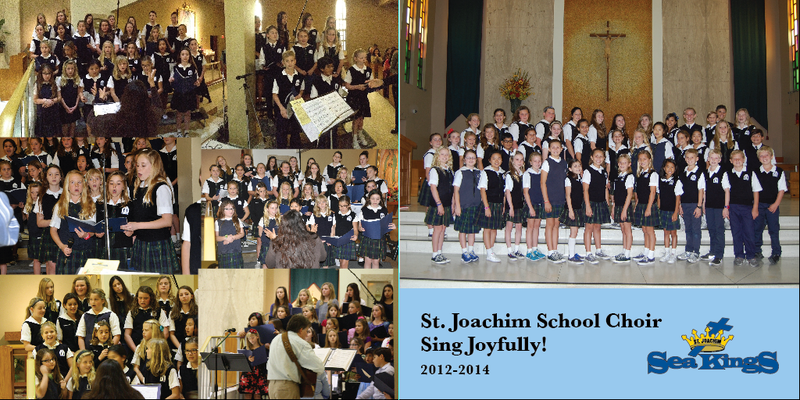 The St. Joachim Music Ministry performs all of the choral works. The instruments are also played by the capable hands of our own St. Joachim musicians. Click on the name of the song to hear a sample. Recorded from 2003-2005, this is a collection of responsorials for use in the Liturgy of the Word. The settings are all what we call "Andrewisms" which usually means that they will be a bit odd. Many of them are well known texts such as “If Today You Hear His Voice” and “The Lord is My Light," while many others are the more obscure texts (which only come up once every three years) like “You Are A Priest Forever” and “You Are My Inheritance." All are given equally vibrant settings. It is full of powerful music and is a very prayerful listening experience. The first cut “Canticle of Zechariah” has been published and is available from OCP. Mezzo-soprano Helena Buscema, cantor at St. Monica’s Catholic Church in Santa Monica adds her hauntingly beautiful voice to the mix, while the St. Joachim Music Ministry performs all of the choral works. Those familiar with this recording from the 1980s have officially dubbed this the National Anthem of Pizza. In a “Weird Al” sort of way, Andrew presents the many assets of pizza on the crust of his usually “rockin" banjo. Click The Pizza Song to listen or download a free mp3 copy. Dr. Dimento is the only executive of any sort that has expressed any interest in the song, but it’s good for a few chuckles. A few of these are still left from a concert which took place in 2002. Though a little rough on the edges, it does capture some of that elusive “live” energy that is hard to get in the studio. The Album features a Marc Robinson rendition of “Prepare Ye” which has become a staple at St. Joachim during the Advent season. Other favorites such as “Glory in the Cross” by Stephen Janco, The Servant Song by Gillard, and the Taize “Jesus Remember Me” highlight moments in the life of Christ. This album was recorded, mixed and mastered by our own Frank Calabretta and Martin McSweeney and as of now can only be purchased at St. Joachim church. St. Joachim Choir Presents: (Cassette Tape; No longer available) This was the choir in its early stages at St. Joachim. This collection of favorites includes a unique gospel arrangement of Amazing Grace and a few others like “Before the Sun Burned Bright” and “May We Praise You” by the St. Louis Jesuits. It was our first crack at a studio recording which turned out quite well and sold about 400 copies.